Dr. Philip Gravinese joined the Mote team in February 2017. 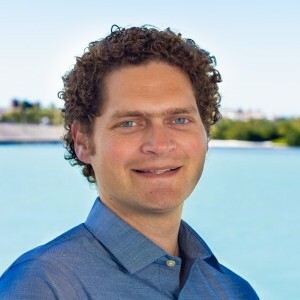 His research interests focus primarily on determining how environmental stressors, like ocean acidification, elevated seawater temperatures, hypoxia, and red tide will impact the reproductive biology, development, and behavior of commercially important crustaceans (stone crabs, blue crabs, and spiny lobster). During his Master’s research he raised larval stone crabs from hatching in order to perform experiments that were designed to characterize how stone crab larvae control their vertical swimming in response to endogenous and exogenous cues (light, pressure and gravity). One of the greatest challenges for the management of crustacean fisheries is the inability to adequately correlate the success rate of larvae and juveniles recruiting back to the fishery with fine-scale environmental changes that occur within coastal habitats. The research in Dr. Gravinese’s laboratory begins to address this challenge. His research interests include determining the mechanisms that underlie the recruitment and settlement behavior of larval crabs by assessing the role different environmental and chemical cues play during development, habitat selection, and metamorphosis. His lab is also attempting to characterize how combined stressors like elevated temperature and hypoxia (low oxygen) can impact the tolerance and recovery of marine crustaceans. Recently, Dr. Gravinese has been conducting experiments to determine the stone crab’s tolerance during red tide events that usually occur along Florida’s west coast. Dr. Gravinese’s research has the potential to identify trends that may modulate successful recruitment in several crustacean fisheries. A more comprehensive understanding of how post-larvae and juveniles respond to combined environmental stressors will provide additional tools for managers to use in their interpretation of crustacean fishery data. The results from this work can be incorporated into predictive models designed to estimate population sizes as natural and anthropogenic disturbances continue to drive environmental changes into the future. Dr. Gravinese also brings 13+ years of teaching experience to Mote. He spent six years teaching in Florida’s public schools and as an adjunct professor for Eastern Florida State College before returning to pursue his Ph.D. in 2011. During his Ph.D., he participated in an NSF Fellowship that partnered graduate students with educators to integrate parts of his dissertation research into thematic lessons for K-12 students. He still teaches as an adjunct for St. Petersburg College. Dr. Gravinese’s passion for outreach stems from his extensive teaching background. Throughout his Ph.D. he attempted to bridge the communication gap between the scientific community and the general public by incorporating the underlying concepts of his research into educational lessons. In 2012, he co-founded an international marine-science film-making competition for K–12 students called Youth Making Ripples. The Youth Making Ripples program challenges the next generation of ocean enthusiasts to promote marine conservation messages using film and 21st century technology. Since its inception, the Youth Making Ripples Film Festival has received 600 submissions from over 2000 elementary, middle, and high school students from around the world. We are grateful for the funding that supports this work, specifically The Steinwachs Foundation, Mote Protect Our Reef License Plate Grant Program and The Mote Scientific Foundation.